Isles of Scilly Travel links the Isles of Scilly from Penzance harbour in Cornwall. From Penzance the ferry sails to St Mary's, the largest island of the Isles of Scilly. The crossing lasts from 2 hours and 40 minutes to 3 hours depending on the tides and the weather and there are daily sailings. 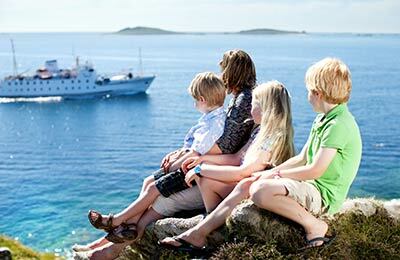 AFerry.co.uk always has the latest prices for Isles of Scilly travel. See below for prices, timetables and sailing times. Isle of Scilly travel operates the passenger ferry the Scillonian III . While this is a relatively small ferry due to the short distances involved, it has everything you need for a comfortable and enjoyable ferry journey including comfortable seating, toilets and an onboard canteen. Please note that you are required to check in 1 hour before the scheduled sailing time. If you arrive later than 30 minutes before your sailing time, you will have to rebook a subsequent sailing. No refunds or credit vouchers are given in these situations. If travelling with large freight items, please report to the quay 1 hour and 30 minutes before your scheduled departure time. The Scillonian III boat navigates every day from Easter to November between Penzance and St Mary Harbour ports. The cruise takes 2 hours and 45 minutes and you will need to check-in at least one hour before departure of the ferry in Penzance. The last check-in at St Mary's is 30 minutes before departure. Note that on Saturdays and holidays there will be far more people than normal in Penzance. This boat has been in service since 1977, it has a capacity of 485 people, it is 223 ft in length, and has a top speed of 15 knots. Relax in one of the cafes, trying to see dolphins or admiring the beautiful Cornish coast while you get further or closer to it. 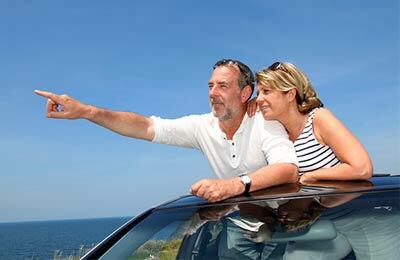 Your holiday will start from the moment you put a foot on the ferry! On the upper deck there are seats on the open air, a cafe-bar serving hot and cold drinks as well as snacks, eating and drinking area, reclining seats indoor and outdoor smoking area. On the upper deck there is another coffee and in the lower lounge you will find more seats and benches. Dogs are allowed on board paying a surcharge, although they will have to be on a leash at all times and cannot enter in the cafés or in the lower lounge. When traveling to the Isles of Scilly it is required to show a photo ID before boarding, e.g. passport or driving license. Children under 15 years are exempted as long as they are accompanied by an adult. Luggage allowance on the "Scillonian III" are 2 packages per person, (hand and suitcase luggage), with a combined weight of 25 kg. Hand luggage may not weigh more than 5 kilograms and have dimensions greater than 40 cm x 55 cm x 20 cm. The suitcase may not weigh more than 20 kilograms and have dimensions greater than 85 cm x 60 cm x 40 cm. If you return on the same day, you are only allowed to carry hand luggage. Make sure that the luggage is labeled with your details. If you need to carry extra luggage, remember that you must pay a surcharge. For same-day return trips there are public parking facilities available at the port and at St Anthony's Gardens, both 5 minutes from the dock. If you need to park your car any longer, there is parking with security services available. How long before departure should I arrive for Isles of Scilly Travel?